FU biologist Jeffrey Joy is among three scientists who have created the world's first one zoom software for viewing the tree of life. 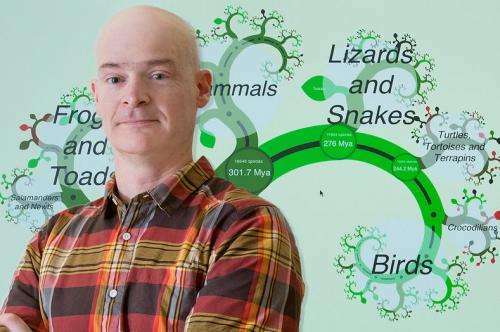 Thanks to three scientists, including Simon Fraser University's Jeffery Joy, we can now see in OneZoom how a major portion of life originated from one cell and remains interconnected in the Tree of Life. The software has been loaded onto a kiosk available for anyone to use in SFU's biology department. Using Java programming, Joy, James Rosindell, Imperial College, London, England and Luke Harmon, University of Idaho, Moscow, Idaho have created customized software displaying a giant green on a computer. With one click of your mouse, the Google-Earth-type software takes you from a big-picture view of a species to seeing the deepest corners of its origins on its branch in the Tree of Life. A first-of-its-kind software, OneZoom currently enables viewers to see the interconnectedness of the world's tetrapods (about 22,000 species)—vertebrate animals with four limbs. By 2014, the whole Tree of Life—the family trees of two million species comprising one big Tree of Life—will be viewable in OneZoom. The creators of the universally downloadable software predict that their all-in-one zoom depiction of nature with related photos, videos, web links, notes etc. will become a model for relaying information in academe, museums and industry. "Within mammals for example," says Rosindell, a biodiversity theorist who first conceived of the program with Harmon, an assistant professor of biology, "you can zoom in on primates. You can see within one visual frame old and new world monkeys, apes, tarsiers, lemurs. You could zoom in on any of those and find further details." "It's a very natural way of displaying large and complex amounts of information because it's the same way we explore the real world," adds Joy. "We move closer to objects of interest to see them in extra detail." Joy, who describes himself as a techy evolutionary biologist, and SFU biologist Arne Mooers, supplied and programmed the data capturing all species of birds on one branch of the Tree of Life. Joy also tested the software. In one click he proudly shows how to find and zoom into the work of any SFU researcher who has published material connected to the Tree of Life. "What is really neat is that people can download a copy of OneZoom and use it to visualize their large data sets," notes Joy. "This is very cool and not really possible any other way."